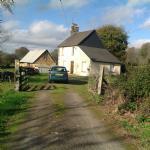 Detached house and barn set in approx 2 acres, in a quiet rural location. Ground floor: lounge dining kitchen area with newly fitted kitchen. One bedroom and newly fitted bathroom. LPG gas central heating and double glazing. 1st floor: two bedrooms requires some renovation. Large attic room with staircase. Some furniture included. Avranches approx 15km away. 2kms from the village of Isigny Le Buat. Stylish Longere set in 6300m² of pretty peaceful countryside near to the town of Isigny le buat. Half the land is garden with fruit trees mainly apple and 2 large cherries, a bread oven and 2 further outbuildings, there is also an established vegetable plot and an ornamental fish pond. The other half comprises a field with small stable; this has a separate entrance and is used for sheep and horses. This impressive property is located on the edge of a village where there is a bar & restaurant a short stroll away. Set within its own grounds with views over a nearby lake, the home comprises of dining room, lounge, kitchen/breakfast room, office, 5 double bedrooms and a lower level area with 2 workshops, wine store and garaging. Old stone farmhouse which has been renovated and extended at one end, with the original old barn still intact at the other end This is a delightful property with charm and character which has been tastefully restored incorporating the comforts of modern living with original retained features. The property sits on a plot of just under half an hectare (4890 m²) with pretty landscaped terraced gardens, stable block and paddock. Large stone house, renovated, comprising 4 bedrooms, lounge, dining room, kitchen, utility room, conservatory, 1 bathroom, 2 shower rooms. Garden, veg.plot, orchard, over-ground swimming pool, outbuildings/garage. Land of over an acre. Countryside views. Renovated family home, fully insulated, double glazed and clad in wood. 4 bedrooms, 2 bathrooms, kitchen, lounge, veranda, office, cellar, boiler room. Habitable area 167m2. Large garden 5618m2. Outbuildings and barn, approx 300m2.